How Much Simpson Desert Can Jane Trumper Bear? 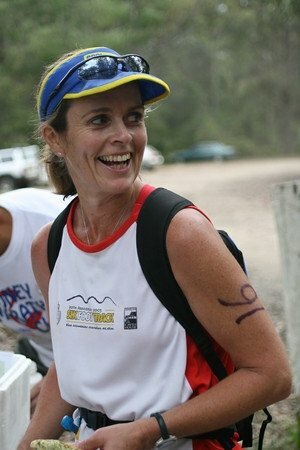 Jane Trumper has just become the first woman to run across Australia’s harsh sunburnt Simpson Desert. Drinking up to 15 litre of water per day in temperatures approaching 45 degrees Celsius, this nurse from Dee Why, who only took up running 8 years ago, set out at dawn on April Fools Day, 2012, uncertain of what lay ahead. 10 days and 660km later, she made it to Birdsville, home of the famous outback races, for a beer, a bath, and a comfortable bed. At age 51 going on 35, and nicknamed Small in reference to her subtle height, Trumper has an irrepressible lust for life that draws supporters to her. Her friend Susan Griffen came from Tokyo to keep her company along the way, new friends Garry and Janet Tapper drove their 4WD from York in WA and picked her up from Alice Springs Airport and crewed the entire run, alongside another vehicle from South Australia, driven by supporters Peter and Ellis. Any escape from the heat, perhaps running under the moon? “I did no running at night – too dangerous out there, no way in the world,” she says, matter-of-factly. With the risk of snakes, even after sundown, the option of running in a cooler time of day just wasn’t available. There would have also been the added strain on the support crew of making and breaking camp – a laborious process of bedding, stoves, food and water preparation, and repacking vehicles – twice a day rather than once. So how did she keep running day after day, and what was her routine? The most famous sand dune in the Simpson is named Nappanerica in the local dialect, but visitors just know the 40-metre high sand mountain near the Desert’s eastern boundary as Big Red. While Trumper’s last attempt to cross the desert was stopped by fires, this time heavy rains nearly saw her adventure delayed by floods. The combination of mud and sand was enough to stop one of her support vehicles, forcing the other to tow it. Sand dunes aside, the greatest highs and lows in ultra marathon are usually deeply emotional and personal. The day after completing this epic challenge, how does she feel? Today, she says she could easily go for a run, maybe a 10km, but warns that it would be slow. She’s returning home briefly at the end of the week, but only as a pitstop. With just a couple more races now until she reaches her 100th ‘standard’ marathon, she’s off this weekend to run the Canberra Marathon. See Jane’s blog at www.UltraSmall.wordpress.com. Please visit it to donate to Bear Cottage.